Our lives have been a bit hectic for the past few weeks. I won’t bore you with the details right now, but I will apologize for neglecting the blog a bit. Lucky for you, we have been busy cooking and crafting up a storm, so there will be lots to share soon. In the meantime, here’s a quick recipe we recently tried for a super simple sherbet that takes just five ingredients to make. I know, I know. Summer is over! But I’m not quite ready to move on to the pumpkin-flavored goodies just yet (it’s not even October). And we just spent the last few days in North Carolina, which is still enjoying some warm temperatures during the day. This refreshing treat is a great way to hang on to the fading warm temperatures while we can. The sherbet was inspired by a recipe I spotted on a Buzzfeed post for a three-ingredient frozen lemon-buttermilk dessert. It turns out, that person got the original recipe from the website for Bon Appétit. We put our own twist on it by incorporating a blueberry compote we had whipped up a few days before. The result: A tart, sweet dessert that is simple and refreshing—and a perfect way to wind down on a hectic day. 1. Combine the buttermilk, lemon juice, lemon peel and sugar in a medium bowl. Whisk until sugar is dissolved, cover and store in fridge until well chilled (about 3 hours). 2. Once chilled, pour mixture into an ice cream machine and churn until nearly finished. Once you think you have about 5 minutes remaining, add the blueberry compote and continue to let the ice cream maker do its thing. When complete, transfer to a freezer-proof container and freeze for 2 to 4 hours or more. SWWU Tip: Curious to know why I called this creation a sherbet instead of a sorbet? 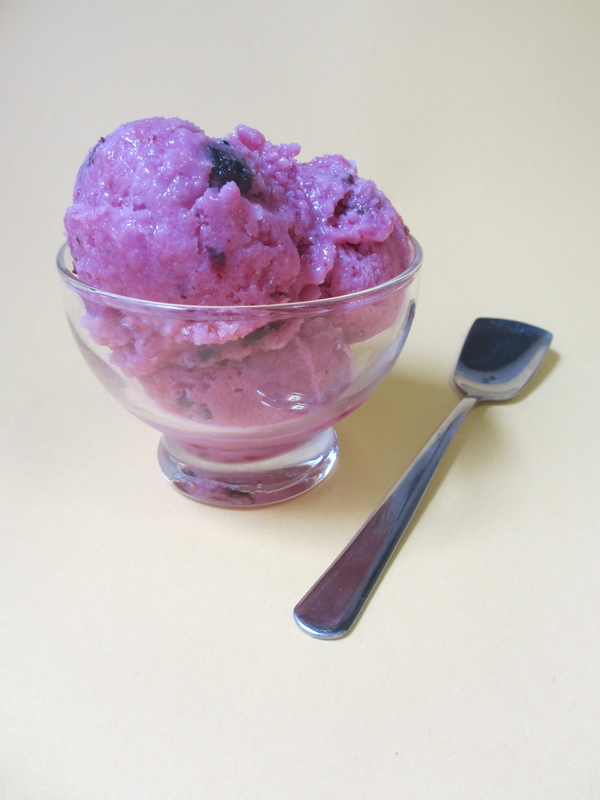 A bit of research revealed that adding dairy (be it milk, buttermilk or eggs) to a sorbet actually makes it a sherbet. Either way, it’s delicious! Like what you see? Check out what’s inspiring us on Pinterest, follow us on Twitter @SWWUblog and like us on Facebook for bonus photos and content. This entry was posted in In the Kitchen and tagged @SWWUblog, blueberry, buttermilk, compote, ice cream, in the kitchen, lemon, recipe, sherbert, sherbet, sorbet by Something We Whipped Up. Bookmark the permalink.